Fisch Why It Works - Dont buy fake gold coins. Get the Fisch. Protect your gold investment. Coin name and the fine gold or platinum content in troy ounces and grams. or The Fisch. Slot checks the maximum diameter and thickness. Recess checks the shape and locates the coin for the weight check. Fulcrum checks the minimum weight. The Fisch tips slightly below the manufactured weight to allow for acceptable wear. Gold and platinum is much denser (and therefore heavier) than the common metals such as lead, brass, copper and steel that are used to make fake bullion coins. For example: A fake made from lead to exactly the same thickness and diameter as a genuine Krugerrand would be 35% lighter than the genuine coin. If made the correct weight and diameter, it would be 54% too thick. Metals with a density comparable to gold that could be used to make a fake coin correct in both weight and size are the platinum group metals and tungsten. The price of the platinum group metals precludes their use. Platinum has a greater density than both gold and tungsten. These are the minimum allowable weight, maximum allowable thickness, maximum allowable diameter and the shape as specified by the issuing mint. 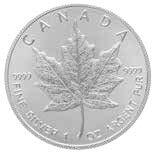 Coin name and fine silver content in troy ounces. or The Fisch. 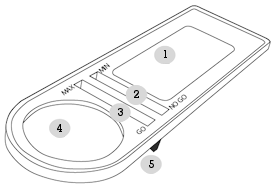 "NO GO" slot checks the minimum thickness and diameter. If a coin passes through the slot, it is undersize. "GO" slot checks maximum thickness and diameter. If a coin will not pass through the slot, it is oversize. Fulcrum checks the weight. A coin of the correct weight will balance the Fisch. A coin that will not balance the Fisch is, depending on which way the Fisch tilts, either too light or too heavy. The silver coins checked by Fisch have a density (weight) different to the common metals used to make fakes. 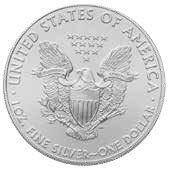 For example: a counterfeit made from brass to exactly the same thickness and diameter as a genuine 1oz American Eagle silver coin would be 19% too light. If made to the correct weight and diameter it would be 23% too thick. 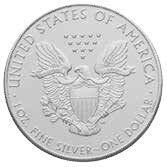 For example: a counterfeit made from lead to exactly the same thickness and diameter as a genuine 1oz American Eagle silver coin would be 8% too heavy. If made to the correct weight and diameter it would be 7.5% too thin. For example: a counterfeit made from brass to exactly the same thickness and diameter as a genuine U.S. Silver Dollar would be 17% too light. If made to the correct weight and diameter it would be 21% too thick. The Fisch is a precision made instrument designed to accurately check the vital measurements of a specific coin. A combination of different metals could be used to make a fake silver coin of the correct size and weight - but it would have to be made very accurately to pass the Fisch. Use with the Ringer to detect common metal and tungsten fakes. - Both the wrong size and the wrong weight. The resonance frequency (sound) of a coin when it is struck by the Ringer is determined by its material, size and shape. If a fake coin is the correct size and shape, but is made of the wrong material, then it will most likely have a different sound. The sound of a tungsten fake is very different to that of a 916 gold coin, less obviously different to that of a 999 gold coin. While a gold coin rings, a tungsten fake does not ring at all. Only a dull thud will be heard. This is demonstrated by The Ringer. Put the coin halfway between the rim and the center the coin towards the hammer so that more of the coin is over the hammer. Squeeze or push down on the Ringer over the arms to hold the coin more firmly. Hold the Ringer up to your ear when you ring a coin. The smaller the coin, the higher the frequency and this will help you hear it. 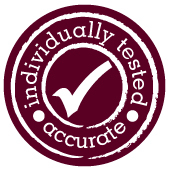 The Ringer is designed primarily to be used to detect tungsten counterfeits of 1oz gold coins. 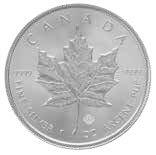 The Ringer can also be used to check 1oz silver coins as a different composition of metal/s used to make a fake will give a different ring tone to that of a genuine coin. Having said that, the fake 1oz silver coins we have checked and those that have been reported are too thick and will be detected by the Fisch. 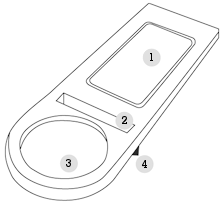 This emphasizes the necessity of using the Ringer as well as the Fisch to check a coin. The smaller the coin, the more difficult it is to ring. The limit is probably a coin that is no smaller than 1/2oz. * However no tungsten fake coins of less than 1oz size have been reported. Use the Fisch to check for common metal fakes such as lead, brass, copper and steel or combinations of these metals. *A user reports getting a good ring on a British Sovereign. So this means that a coin as small as 1/4oz gold would be ring-able. On the same Fisch Family pages, there are also pictures of genuine American Eagle, Krugerrand & Maple Leaf gold coins alongside tungsten based counterfeits (as well as genuine and fake silver coins.) These pictures are important tools in detecting fake coins: The tungsten fakes, due to the manufacturing method used, do not have the definition, or detail, of a genuine coin. The Fisch Family pages are a resource for Fisch users only. On purchasing, you can register for immediate access. "We think we have even detected a fake coin with the Ringer. A Gold Eagle did not ring even a little bit, no matter how many times we tried it, even though other coins rang like a bell, proving we were using ringer correctly. We returned the coin to the dealer." "I received the Ringer yesterday. It worked great on a variety of coins I tested. Excellent design on this ingenious product." "I can highly recommend "The Ringer" ($104, delivered)! Smile..."